At U.S. based label and production house Zion High Productions they go their own way. That was clear last year when they issued saxophone player Jah Bless’ excellent instrumental album Redemption. Now they have released another daring set. Nyacoustic Chants probably isn’t the multi-million selling, Grammy award winning and cross-over-tinged set that other labels are looking for. No, this set is something else. 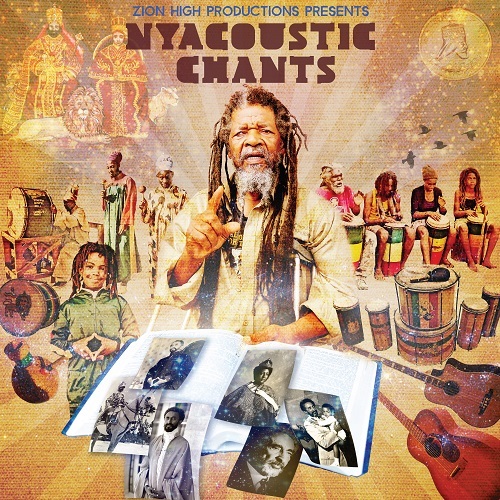 Nyacoustic Chants – produced by Zion High Productions’ own Jah David along with partners from powerhouse roots reggae production team of Zion I Kings – offers 13 percussion-driven tracks greatly inspired by the likes of Count Ossie and Ras Michael. The rhythms are slow and atmospheric with spiritual depth. Chanters and singers range from reggae luminaries such as The Congos, Earl “Chinna” Smith and Michael “Mykal” Rose to more contemporary artists like Pressure, Jahdan Blakkamoore, Lutan Fyah, Jah9 and Midnite. The album is bubbling with consciousness and uplifting vibes. It’s the sound of natural mystic. It’s a melodic and pulsating feast, so gather your friends and prepare them for a journey to another musical dimension.